This year’s AL Wild Card Game will be a battle of competing philosophies, at least when it comes to the choice of starting pitchers. On Tuesday at Yankee Stadium, the opposing managers announced their picks for Wednesday night’s game. The Yankees have decided to remain old-school, with manager Aaron Boone tabbing 24-year-old righty Luis Severino, an All-Star who despite second-half struggles finished fourth in the league in WAR (5.7) and in a virtual tie for fifth in FIP (2.95) — and one whose early exit in last year’s Wild Card Game pushed the Yankees into a bullpen-oriented approach anyway. As for the A’s, a club whose rotation has has lost staff ace Sean Manaea and five other starters to season-ending surgeries, manager Bob Melvin is going the new-school route, with 29-year-old righty Liam Hendriks as his opener — a first of sorts. In eight September starts, Hendriks threw a combined 8.2 innings. Despite Girardi’s reservations, it was clear that the Yankees were built for such a scenario thanks to general manager Brian Cashman’s July 19 (re)acquisition of David Robertson and Tommy Kahnle to add to a bullpen that already included Aroldis Chapman and Dellin Betances. “A veritable clown car of effective righties who can miss bats and take over before Twins batters get too familiar with Severino,” is how one wag put it. Despite Girardi’s best-laid plans, “normal” went out the window in the first inning, when Severino retired just one of the six batters he faced, served up two homers, and dug the Yankees a 3-0 hole. With Chad Green, Robertson, Kahnle, and Chapman combining to get 26 outs (13 by strikeout) while allowing just one additional run, the Yankees’ bullpen kept the Twins at bay long enough for their formidable offense to go to town on Minnesota starter Ervin Santana and lesser relievers. The Yankees even went through something of a dry run with an opener on Monday, September 24 against — who else? — the Rays. With Jonathan Holder making his first start since 2015 in High-A, Boone used eight pitchers, with exiled starter Sonny Gray representing the only one to throw more than one inning. The results were compelling: two hits and one run allowed, with 13 strikeouts to offset six walks in a 4-1 win that, coincidentally enough, eliminated Tampa Bay from postseason contention while clinching a berth for Oakland. “I don’t think it’s fair for them to say a ‘bullpen day,’” Rays Manager Kevin Cash said afterwards. “More like a ‘closer day.’ They all just kind of come in there and have wipeout stuff from the second that Green steps on the mound.” Indeed, between Betances, Chapman, Robertson, and Zach Britton, who together accounted for four innings that night, the Yankees have no shortage of experienced ninth-inning types at their disposal. 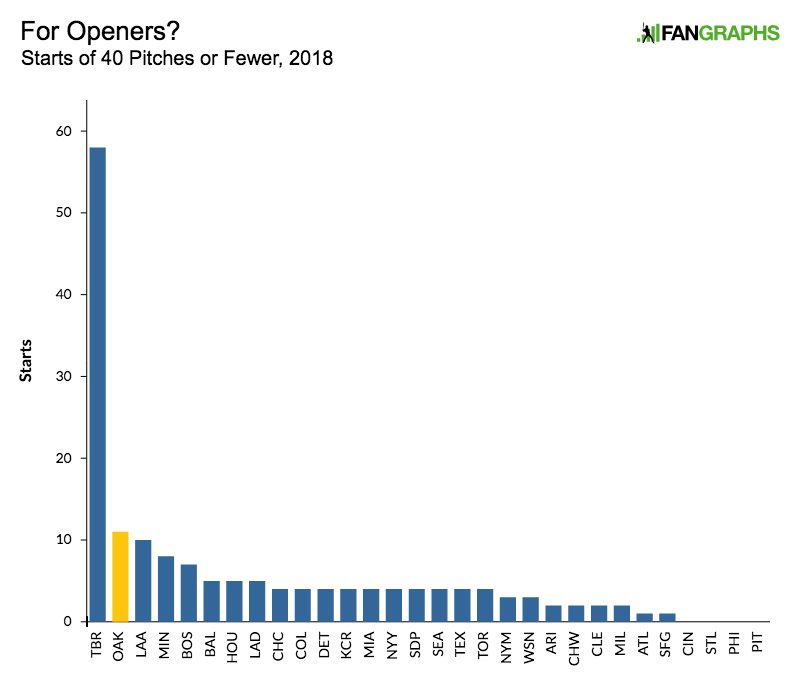 That’s part of what gave the idea of a bullpen game its appeal, particularly with relatively little clarity regarding the team’s options to start. Severino had emerged as a Cy Young candidate in the first half, posting a 2.31 ERA and a 2.75 FIP en route to a spot on the AL All-Star team, but he was pummeled for a 5.57 ERA in the second half. His FIP was just 3.37 in that latter span, but his BABIP shot from .278 to .379, his homer rate from 0.7 per nine to 1.3, and his slugging percentage allowed from .316 to .490. From July 7 to September 5 — the last outing a six-run, 2.2-inning grind against this same A’s club — he made just two quality starts out of 11, with a 6.83 ERA and a 4.66 FIP. Only over his final three starts, during which he allowed four runs in 17.2 innings against the Twins, Red Sox, and Rays, did he right the ship. “I feel like after some bumps in the road certainly the second half of the season, he’s turned a corner and really started to throw the ball better,” Boone said of Severino on Tuesday, adding that “performance, experience, stuff, opponent” and input from his coaching staff and Cashman went into the decision. Tanaka was almost a mirror image of Severino this season, pitching to a 4.54 ERA and a 4.91 FIP before the All-Star break — during which he missed a month due to bilateral hamstring strains suffered while running the bases in an interleague game at Citi Field — and a 2.85 ERA and a 2.98 FIP after. However, he was pummeled for nine runs in eight innings in his final two starts against the Red Sox and Rays. Happ, the sole lefty under consideration, gave the Yankees a 2.69 ERA and a 4.21 FIP in 11 starts after being acquired from the Blue Jays on July 26. For what it’s worth, the A’s have generally fielded a righty-heavy lineup, with Matt Olson the only lefty-swinging regular, though Nick Martini has lately platooned in left field with righty-swinging Mark Canha. Jed Lowrie is the team’s only switch-hitter. Even with that tilt, the A’s had the league’s second-highest wRC+ (112) against righties, and they were tied for third (105 wRC+) against lefties. Of the 43 qualified AL starters, Severino’s .280 wOBA allowed to righties ranks 10th, with Happ’s .313 at 24th and Tanaka’s .324 placing 29th. By comparison, Chapman (.238), Betances (.250), Robertson (.254), Holder (.261), and Green (.273) were all better at handling righties than any of the three starters. Hendriks is the leader of that conga line. Roughed up for a 7.36 ERA and a 6.44 FIP in 11 first-half innings, he was designated for assignment on June 25 and outrighted to Triple-A Nashville, where he spent July and August. A long-toss program helped him boost his velocity: according to the Pitch Info daya, his average four-seam fastball velo jumped from 93.8 mph before the assignment to 96.7 mph after being restored to the 40-man roster in September. The 29-year-old righty allowed just two runs in his eight “starts”; only in the first of those turns did he go longer than an inning or throw more than 28 pitches. His second start came against the Yankees on September 4; he struck out Brett Gardner, then retired Giancarlo Stanton and Andrew McCutchen, as well. The A’s went 4-4 in those games, with Daniel Mengden or Chris Bassitt — a pair that combined for 24 starts earlier in the season — usually following and throwing three to five innings as the “bulk guy.” From there, Melvin would piece it together with a bullpen bolstered by the in-season acquisitions of Jeurys Familia, Fernando Rodney, and Shawn Kelley to augment the work of ace closer Blake Treinen and setup men Lou Trivino and Yusmeiro Petit. “Same as any other game. I’m taking it the same way, warming up the same as I do, trying to keep it as much as a relief appearance as I can. All it means is I’m relieving in the first inning. Looking over Oakland’s log of such starts, only Trivino’s one-inning appearance on September 28 represents a true use of the “opener” role with a pitcher besides Hendriks. Triggs and Brett Anderson departed the other two early due to injuries. Still, given the rough performance of their ramshackle rotation in September — a combined 4.66 ERA and 5.08 FIP from Edwin Jackson (five starts), Mike Fiers (four), Anderson (four), Trevor Cahill (three), and Mengden (one), it’s understandable why they’d search for alternative approaches and lean heavily on their successful bullpen. As Sullivan pointed out on September 10, the A’s bullpen was on pace for a record WPA, but regression over the final few weeks dropped them merely to fifth in our calculations, which go back to 1974; the 2012 Orioles bullpen holds the record with 13.5 WPA. The numbers above, of course, include the contributions of players currently absent from each club’s respective roster — and omit the starters who will be available out of the two bullpens on Wednesday night. According to Boone, the Yankees will carry 10 pitchers including Tanaka, Happ, and Lance Lynn to provide length and perhaps some tactical advantages as well as accounting for contingencies. The A’s will carry 11 pitchers, including Fiers as a potential bulk guy if not necessarily the first pitcher to follow Hendriks. (Mengden has been sent to Arizona to prepare for a possible Division Series start.) Unless Melvin chooses to include Anderson, Ryan Buchter will be the only lefty to counter lefties Didi Gregorius and Brett Gardner. One game certainly won’t settle this philosophical clash, but it will be fascinating to see how the choices of Severino and Hendriks play out in the crucible of October baseball. The Rays’ innovation earlier this year led the A’s to go this route, and who knows where this could lead if Oakland has success on the game’s biggest stage. We hoped you liked reading The Opener Goes to the Postseason by Jay Jaffe! This game will be really interesting because while it could revolutionize things if it goes well for Oakland and bad for New York- it could also set back the bullpenning movement if you will if the opener doesn’t go well for Oakland while Severino pitches a gem. I think most people expect that Oakland is going to be a heavy, heavy underdogs, so I doubt it will set it back a lot, except if Oakland ends up running out of pitchers and loses it in extra innings. But if Oakland pulls it off, then yeah the opener will definitely take a step forward. If the Yankees blow the doors off of the A’s first 2-3 innings- you bet it would. If it’s like 9-0 after 3. Especially if the A’s Jackson comes in later in the game and throws 4-5 scoreless innings. Other thing is that traditional starters have done really well the last 2 days. 5 ER in 35.2 ip. 1.26 ERA. So if the one bad pitched game is a bullpen game- it’s going to stick out like a sore thumb. To act like it’s all possible goodness and no risk is rather naive. If they lose 5-0? There would be a lot of folks in the media that would absolutely say that. Especially given how the other “real” starters have done so exceptionally well these last few days(and by definition, Severino would just add more to that column). If by Folks in Media, you mean Chet Broman writing for Bleacher Report or something , then you’re right. Nobody smart or even decently competent would use a ‘few days’ and ‘2-3 innings’ to declare the success or failure of a strategy or even the abilities of a single pitcher. I think many members of this community would declare it a success if it worked. The media has about as much influence on MLB front offices as the cheerleaders have on NFL coaches, and thank heaven for that. Won’t Hendricks get pulled before he was able to give up 5 runs ? Severino gave up 3 last year before he was yanked last year, stop loss is 3 runs on Hendricks. It will be interesting to see if Oakland uses Jackson early(ish) in the game, like any other reliever. I have to believe they won’t, and he’s only there so they don’t run out of pitchers (i.e. he’s there to come in in the 10th or 11th and pitch until the game ends either way). i wouldnt be surprised if severino only faces the oakland lineup one time completely, and we get effectively two bullpening teams. If he’s going well, I don’t think they’re going to take him out just to take him out. Especially if they have a lead. With their remarkably excellent bullpen – the best in the playoffs by far – the Yankees would smart to pull Severino after one time through the order. it would be even smarter to use an opener for 1-2-3 and then have Severino face 15 batters and bring in a new reliever for the top of the order again. Given the way the A’s line up is constructed, I don’t think going 4-9, then 1-9 is that advantageous over just starting. You’d miss Chapman the second time, but 4-6 is Davis, Olsen and Piscotty. All of which do absolutely fine against RHPs. The A’s lineup is just incredibly balanced, which makes getting cute to squeak out small advantages even harder than it already is. Why would they do that? That isn’t how the first Wild Card game worked out. Playoff baseball has always been quick to pull starters but we didn’t suddenly hop into an alternate reality. Wubba lubba dub dub! If teams use the results of one game to judge a strategy, they are bad at making decisions. Today’s game will be the first exposure that a lot of fans get to the concept, so it could impact their perspective. That, in turn, could have an impact on press coverage, which could have a slight impact on a team’s willingness to try it. But that has to be a very small effect, and, at the end of the day (season), what matters to fans and teams is winning ballgames. Superior strategy usually helps with that, and the evaluation of a strategy should not be impacted by 1 game. I am far from convinced that teams examine the effectiveness of radical ideas. I think they use data to concoct them, but measuring success is extremely problematic. The same people with the bold ideas would in all likelihood be also measuring the outcomes, which is why some flawed concepts continue to linger. There is an analogy to an MLB investigation somewhere in here… Success isn’t something you can measure accurately unless you want to oversimplify the outcomes. Good ideas don’t always result in wins and bad ideas don’t necessarily end with losses. In the end, the humans play a pretty large role in what some people like to look at as a controlled experiment.